I listen to a lot of different types of music. I go through seasons as a listener and find myself pulled in one direction more than another. Hip hop and acoustic song-writing tend to be my mainstays, but the latter feels like more of my center than the former. The two artists that I'm most drawn to in this genre are Alexi Murdoch and The Tallest Man on the Earth. Alexi Murdoch's music holds a special place in my heart: his song "Orange Sky" gave the name to my first blog. His quiet music has been a soundtrack for many moments in my life. The Tallest Man's music ignites me with its poetry and I turn to it often. This past summer, The Tallest Man started recording demos of songs on YouTube. It's one of my favorite YouTube projects. (Check out its playlist.) The artist often reflects a little bit before showing the song. Even though the videos are communication meant for the public, it feels sincere and personal. This morning, I read a Facebook post from Alexi Murdoch that he's trying to finish up a new album. He writes, "And also from all those enquiring patiently, and even impatiently, about new music...yes indeed. I am ok. I have been at sea. I haven't fallen in." A lot is going on in the news these days. We should keep paying attention carefully to the way power moves around and exercises itself. And, we should work to protect and take care of each other. Still, we shouldn't forget that people are still moving, still making. We should, too. In his last newsletter, Patrick Rhone showed us where his cracks are. Patrick is someone I've followed and for some time now and you get to know someone through their words. Reading these particular words demonstrated the weight of his current challenges but also his grace and humanity. Thankfully, this particular struggle concluded as well as it could have. [His daughter, Zani] proceeded to lay them out and tell me about the various places and planets they represented. She then removed one from her thumb and handed it to me. It was not until the middle of the long drive home that I realized that a space is the only difference between nowhere and now here. It’s a koan — a Buddhist riddle meant to transmit a lesson. Nowhere is where all things begin and where all shall return. Now/Here is the space in between — the present moment. When I read Zani's koan, I immediately thought of this snippet of conversation between Krista Tippet and Father Greg Boyle. In particular, his translation of the Desert Father's mantra "today" to "Now, here, this." FR. BOYLE: And that was sort of my experience when I went through leukemia and greatly liberating. But because I’ve had to bury so many kids, 183 kids — and kids I loved and kids I knew and killed by kids I loved. I mean, boy, if death is the worst thing that can happen to you, brace yourself because you will be toppled. And the trick is not to be toppled. The trick is to compile a list of all of the fates that are worse than death, but also compile the list of all the things so numerous to list, all the things that are more powerful than death. You know, that’s what Jesus did. Jesus sort of put death in its place. MS. TIPPETT: I read that a couple of days ago as I was getting ready for this and it’s been so helpful for me. FR. BOYLE: Yeah. Whenever the desert fathers and mothers would get absolutely despondent and didn’t know how they were going to put one foot in front of the next, they had this mantra. And the mantra wasn’t “God” and the word wasn’t “Jesus.” But the word was “today.” That’s sort of the key. There’s a play off-Broadway right now called “Now. Here. This.” It’s “Now,” period, Here,” H-E-R-E, period, “This.” And that’s kind of my — that’s become my mantra. Lately, I’m big on mantras. So when I’m walking or before a kid comes into my office, I always say, “Now. Here. This, Now. Here. This.” So that I’ll be present and right here to the person in front of me. I've never really been big on mantras, but this one has stuck with me. I kept it in deep focus during a silent retreat last year and was rewarded deeply by it. I hope that there might be something there for you, too. I'm relieved that Alabama elected Doug Jones to the Senate. Though he didn't run a particularly inspiring campaign, his politics weren't bad, and significantly to the left of many milquetoast Democrats (in Alabama, no less!). Perhaps we should discount this electoral win given the truly abysmal candidate he ran against, but I also think we should take victories where we can get them. The commentariat will dissect what this means for national politics in the coming days and weeks. It's tough to extrapolate too much here, so instead I wanted to share a little bit of humanity that I stumbled upon last night. Nathan Mathis is a local peanut farmer in Alabama. 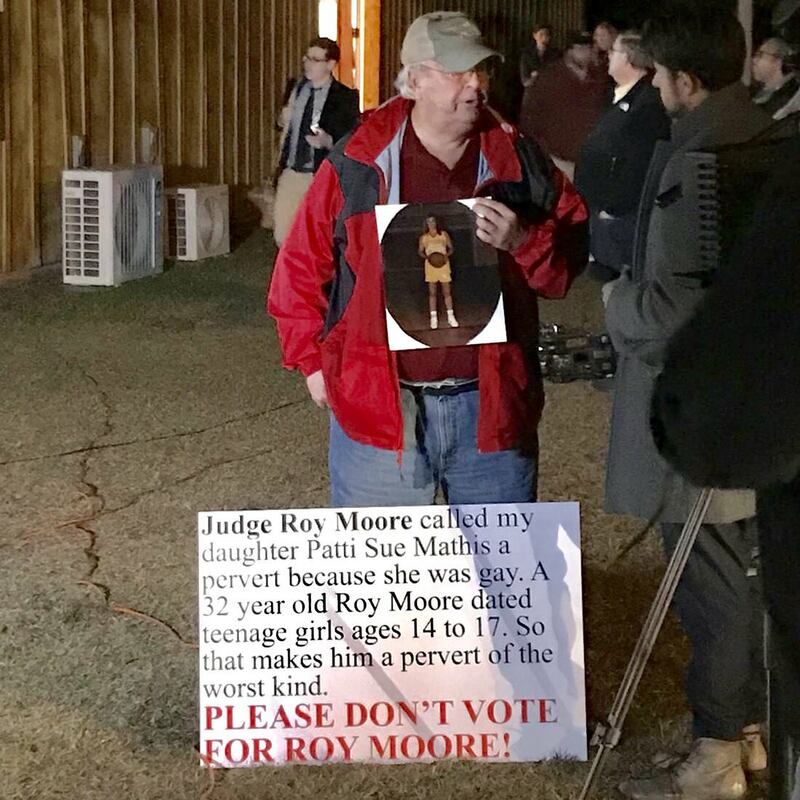 He went to a Roy Moore rally to stand up against the candidates homophobic and hurtful rhetoric (and his hypocrisy). Watch him make a heartfelt case against Moore in this video. His daughter, who was gay, took her own life in 1995. As a letter to a local paper details, the loss seems to have profoundly changed the man. You can read a little bit more about him here. People can change; sometimes it just takes a lot to move them. Today, we can celebrate a little bit of relief and a little bit of humanity. Let's keep working from that place and keep building, pang'ono, pang'ono. One of the things that I'm most grateful for is that I can bike to work. This might seem a little bit of an exaggeration. Let me explain. During the second and third years of law school, I commuted down to Stanford from San Francisco. Though I had some control over my schedule and could keep odd hours that would avoid traffic, I still often found myself stuck in a long haul to and from home. Still, I wouldn't change a thing about where I lived those two years: I was within walking distance from my family's Full House situation (for years now, my sister, brother-in-law, their boy, my mom, my dad, and my brother have lived in a home together), surrounded by good food, and within a block of Golden Gate Park. Now, my work's office is on the Berkeley Marina and it takes about 15 to 20 minutes to bike there. It's getting a little cold in the mornings and a little dark on the way home, but I love my commute. I pass by quiet neighborhoods, office buildings, a post office, train tracks, through a park by the water, over a bridge, and along the bay. For those precious minutes, I'm in my body, in the world. I also appreciate that the trip can take either about 15 or 20 minutes, depending on how hard I hustle. Derek Sivers wrote a great post about biking how you can relax for the same result. I think he's on to something here. Five minutes won't make a difference and can make the ride a whole lot more enjoyable. But, I think he's also missing a piece: sometimes we should push ourselves closer to 15, our heart racing, the wind rushing around us, and pay attention to how our body responds and remind ourselves of our capacity. All this is to say, if you can bike, bike. I saw Aladdin the musical yesterday. It was tons of fun. This morning I asked myself, "What did I like about it?" Aladdin is an old story, but it's an old story that works. I suspect that one of the reasons the story has survived through the ages, adapting for different mediums like books, movies, and musicals, is because it gives you someone (Aladdin) and something (love) to root for. This is dead simple, I know. But the dead simple can be deadly effective. A few weeks ago I talked about the value of asking yourself, "Does it haunt?" Obviously, not everything you do should have the consequence of haunting. Maybe another question to ask, when appropriate, is "Does it give you something to root for?" In ways small and large, stories are vehicles for change. We tell stories in our work: what our company means, what future we see, how our mission matters, and so on. Are we giving the world something to root for in these stories? Asha and I have been watching Community. I've seen it before, but it's the first time for her. One thing I love about the show is that it really rewards viewers who allow themselves to get pulled it. The series has a number of episodes that are a little bit silly: a stop motion animated Christmas episode, a bottle episode that knows it's a bottle episode, a paintball shootout with a post-apocalyptic feel, and so on. It's easy to start watching these episodes and pull back. What's made watching the show with Asha so fun is that we do just the opposite: submit to the story and the fun that comes along with it. The more you let yourself inhabit the universe, the more enjoyable it is. Go on, let go, and get pulled in. Remember that off-hand reference to "a short phone call with my dad" where I helped him "think through a valuable piece he's working on"? Well, that piece is out today in Quartz here. [T]he collaboration between the intelligence community and big, commercial science and tech companies has been wildly successful. When national security agencies need to identify and track people and groups, they know where to turn – and do so frequently. That was the goal in the beginning. It has succeeded perhaps more than anyone could have imagined at the time. Earlier this week, I wrote about why I think the "attention war" is a better framework than the "attention economy." As the Quartz piece demonstrates, the origin of Silicon Valley (and, as a result, the actors in our attention war), is intricately connected to our war machinery by way of the mass surveillance state. As a result, I'm doubling down on this idea of the attention war.